I really love pretty and creative gift wrap. It’s fun to tap a few gifts every year to get a little extra something when it comes to the wrapping and presentation. The fun thing about holiday gift wrapping is that just about anything can be used to spruce up a plain box. If you saw my assorted birds as ornaments or my birdseed ornament project in this holiday series, you know I have a penchant for feathered friends. With that in mind, I’ve created a fun gift wrap idea with an aviary theme. 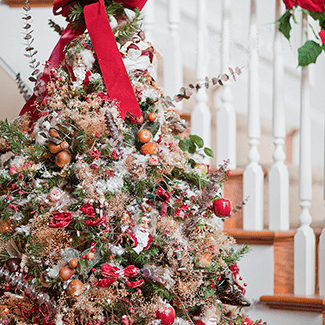 You’ll only need a handful of supplies including assorted ribbon, cinnamon sticks, artificial fruit and a feathered friend to perch on top as well as a hot glue gun. The key to great gift wrapping is to make sure you pull the paper as tight as you can without tearing the sheets. Tight paper around a box results in a cleaner more crisp presentation. Just make sure you pull more fragine papers carefully so they don’t tear. Fold the paper on both ends so the end in a point and then overlap one over the other. You can add even more crispness to the package by creasing the edges of the paper between your thumb and forefinger. Make sure your hands are clean when creasing because dirt and oils can be deposited on the wrapping paper from even slightly dirty hands. Ribbon not only adds a splash of fun color and texture it also serves to hide (or at least obscure) the paper seam along the back of the box. Wrap the ribbon around the box top first and then around the back (covering the seam), criss-cross the ribbon to switch directions. Bring the ribbon up over the sides and loop each end through the top ribbon before tying in a knot. I likeusing wired ribbon because it maintains it’s shape when formed into a bow and does not flop around. Remember to clip the ends of ribbon on a diagonal rather than straight across for a more tailored appearance. The end of the ribbon may seem like a throw-away consideration but it’s another one of those small details that contributes to the overall presentation of the wrapping. Now, I didn’t fork the end of the ribbon for this bird-themed gift wrap but if you fold the ribbon and cut it diagonally (from top to raw bottom) you can create a forked finish. Just about any embellishment can be used as a topper and I think that’s part of the fun of gift wrapping. Slip a cinnamon stick through the ribbon knot to hold it in place. I think it’s the unexpected elements (like pears) in gift wrapping that add whimsy, a sense of fun and real interest. Use a hot glue gun to adhere a few pears together. A small feathered friend is a perfectly sweet touch to top things off. NOTE: Make sure you check your artificial elements for errant hot glue and carefully peel it off before gift giving. Ooops, I missed a glob. Of course every gift under the tree doesn’t necessarily need this special gift wrapping treatment but it’s nice if a few are singled out for something extra. Who wouldn’t love to open this birdie-topped box? Day 22 down, 3 more days to go. Hope you stop by again tomorrow (12/23) for Day 23 of my 25 Days of Christmas series. Button-shaped sugar cookies make for a fun and unexpected gift. Thread with pretty ribbon, package and gift for a great holiday offering.